Upset Sunday: Arizona, Duke, and Wisconsin all lost on Sunday yet all remained in the KPI Top 10 Rankings. All three losses were on the road to three teams who have a combined record of 33-16. Virginia vs. Kentucky: Virginia has three of the top 11 wins of the season while Kentucky has two of the top 5. Both resumes are far and away the best of anyone right now. Virginia and Kentucky are No. 1 and No. 2 in defensive points allowed, yet are No. 118 and No. 33 in points scored. Strength of Schedule: Texas Southern has the strongest SOS in the country through January 12. Kansas will eventually pass Texas Southern and is likely to finish with the No. 1 SOS for the second consecutive season. Dominant at Home: Home teams are 1,976-688 (.742) while road teams have a .258 winning percentage. Scoring is Down: Scoring is down 4.47 points per game, with 55.5% of the decrease coming from fewer made 2-pt field goals, 42.9% from fewer made free throws, and only 1.7% from fewer made 3’s. To points made by @franfraschilla, @RobDauster, @jerrymeyer247: Wed. was lowest scoring (62.9 PPG) & slowest (63.7 poss/game) day this year. To @GaryParrishCBS point on @CBSSportsCBB podcast: Ole Miss 2nd team this year to lose >49% FG, >49% 3pt, >85% FT. Drake (at WMU) the other. Of the 11 teams who have played consecutive OT games prior to Kentucky doing it today, only 3 (Oregon, Texas State, Army) have won both. Slowest game of year. UMKC-NMSU tonight 3rd slowest MT @JohnGasaway: UNI vs Drake: 48 possessions. That's about as slow as humanly possible. Season Scoring Trends: Scoring has continued to trend down (down 4.47 PPG and 6.2% from last year). Scoring in conference play is typically lower than non-conference, and this year is no different so far. Teams averaged 67.6 PPG in non-conference play and are averaging 66.6 PPG in conference play. The margin of victory is 10.6 PPG in conference games (compared to 16.6 in non-conference). 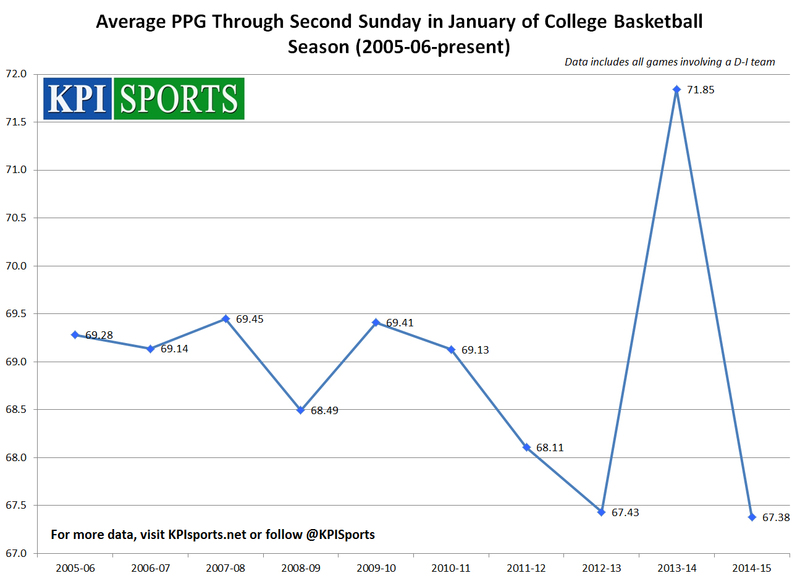 Posted in College Basketball, KPI Sports and tagged College Basketball, NCAA.